Let me just start out by saying that I am absolutely excited that it's finally spring here in the city. Daylight savings has really been doing wonders for my mood: it doesn't get dark until 7 at night, and I feel like I'm full of so much more energy. I'm accomplishing more, and landing more and more work from the blog than ever. Spring is such a refreshing, beautiful season. In line with all things spring and beauty, I decided it was time to inject a little more colour into my cooking. Say hello to this brilliant and vivacious Spring Pasta Primavera, made with a lighter, healthier cream sauce and some lemon zest! I have totally steered away from seafood as of late. 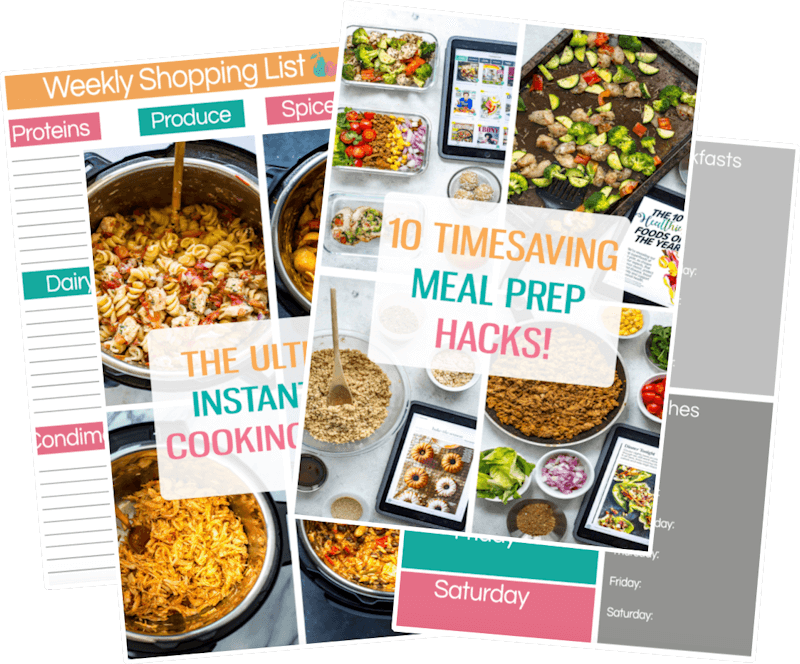 I have no good explanation other than the fact that I have been creating a lot of meatless meals to save money (you can't go wrong with chickpeas! ), and I've been eating a lot of chicken. A sale at the grocery store later, and I'm back on the shrimp bandwagon! The trick to the sauce is using a generous helping of parmesan cheese, and staying away from too much butter or heavy cream. Instead, 2% milk mixed with a bit of flour creates a nice thick sauce, and the lemon really uplifts the flavour alongside the garlic and chili flakes. 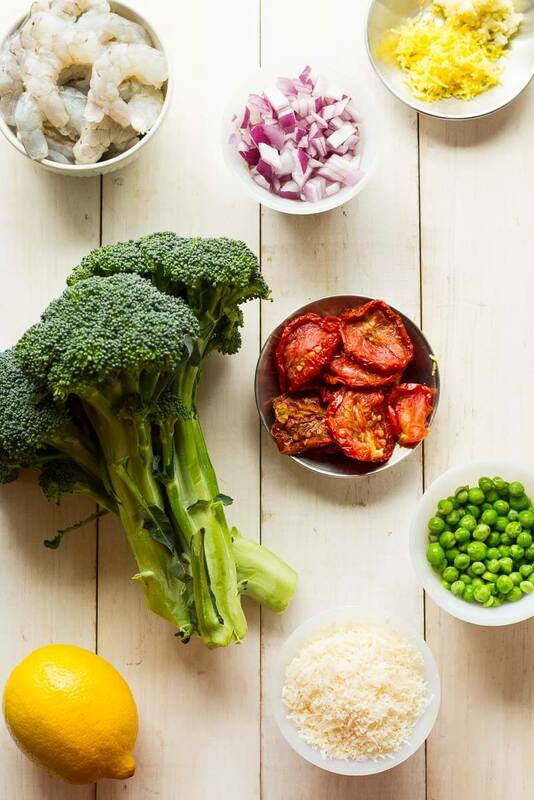 You can really use any veggies you want, but I think the broccoli and sun-dried tomatoes pair perfectly with each other, and of course you need peas to complete any primavera recipe! Guaranteed whoever you serve this to will be gobbling it down in about 30 seconds – good thing it only takes 30 minutes to make. 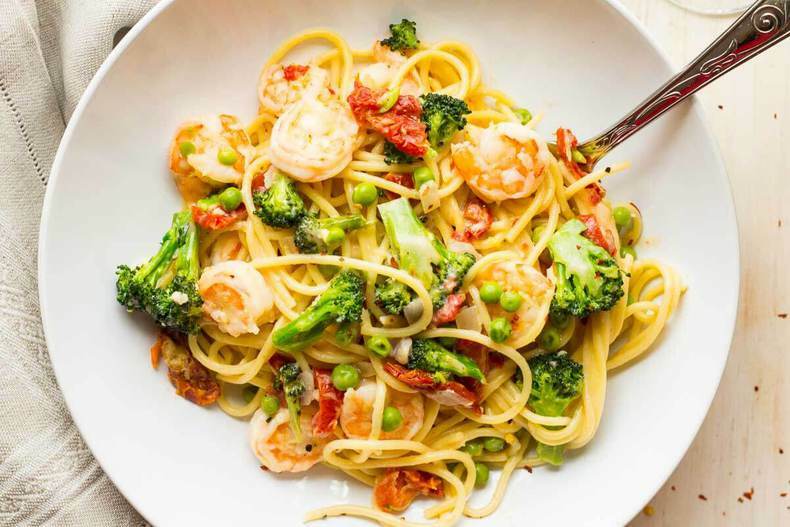 Here you've got the perfect after-work meal for a Friday: quick, easy, delicious, and you most likely have some of the ingredients kicking around in your pantry or freezer. Time to dig out that pound of shrimp you bought on sale two months ago but never got around to using! 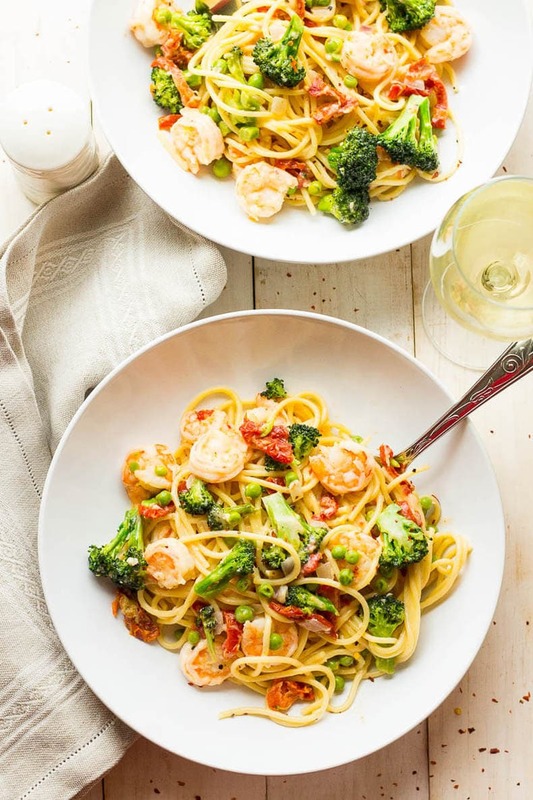 Will you be trying these Lighter Pasta Primavera Bowls? If you try any of my recipes be sure to let me know on Instagram, Twitter or Facebook – I’d love to hear from you! 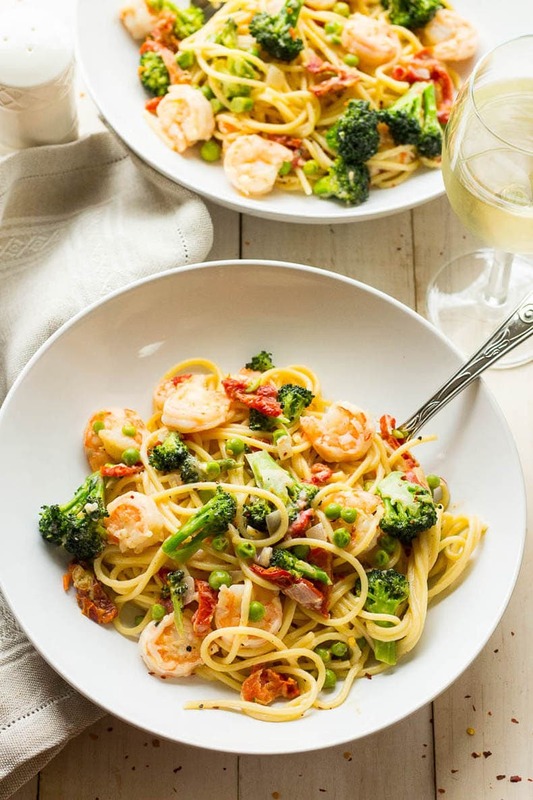 This Lighter Pasta Primavera is filled with shrimp, broccoli, sundried tomatoes and peas for a delicious, easy pasta dinner ready in 30 minutes! Heat a large pot of boiling water on high heat. When boiling, cook spaghetti for about 8 minutes until al dente. Meanwhile, defrost and peel shrimp and prepare veggies. In a large pan, heat butter over medium-high heat. Add garlic and onions and sauté for 30 seconds. 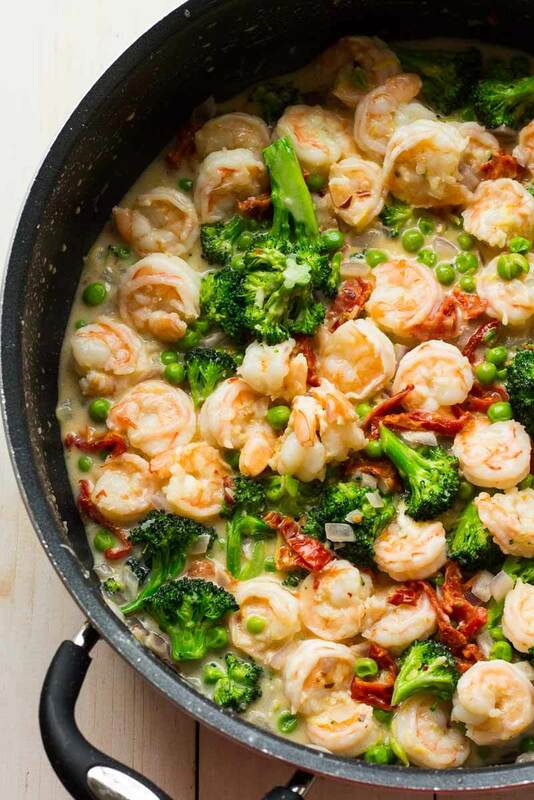 Add shrimp, broccoli, lemon zest, salt, pepper and red chili flakes, cooking for 2-3 minutes until shrimp starts to grow pink. Add flour, milk and cheese, whisking to get rid of lumps. Add sundried tomatoes and peas, cooking for another 3-4 minutes until sauce starts to thicken. Add pasta and a little bit of reserved pasta water, then cook on high for 2-3 minutes, tossing until well mixed. Serve hot alongside a light white wine! Well that was easy. Friday night dinner already on a plate. My shopping list is made, off to the store I go. 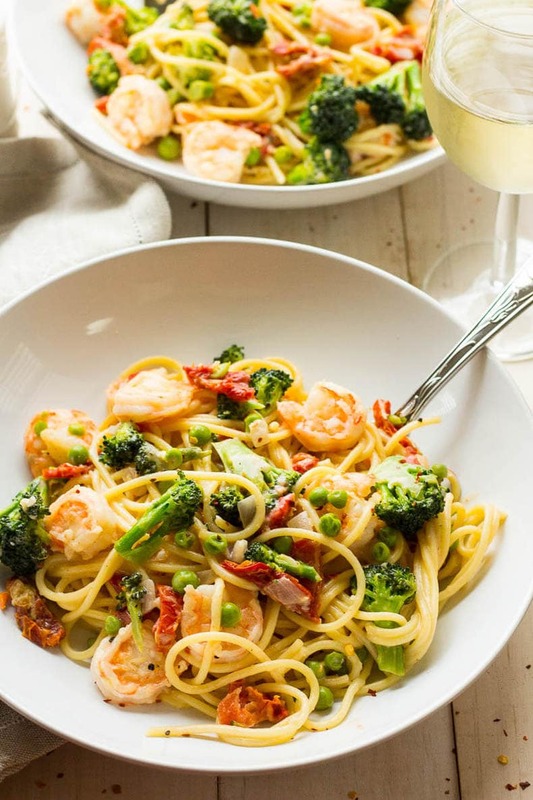 I LOVE pasta primavera…. LOVE it. You’re photos are stunning BTW, so beautiful. Thanks for sharing this recipe. I love it! It looks so healthy and just like the perfect past for spring. I don’t like eating big meals in the evening, so this is perfect! Thank you Angela! My thoughts exactly! I can’t wait for summer when the sun sets at 9:30 at night! This looks so gorgeous, I want to DIVE right into that bowl! 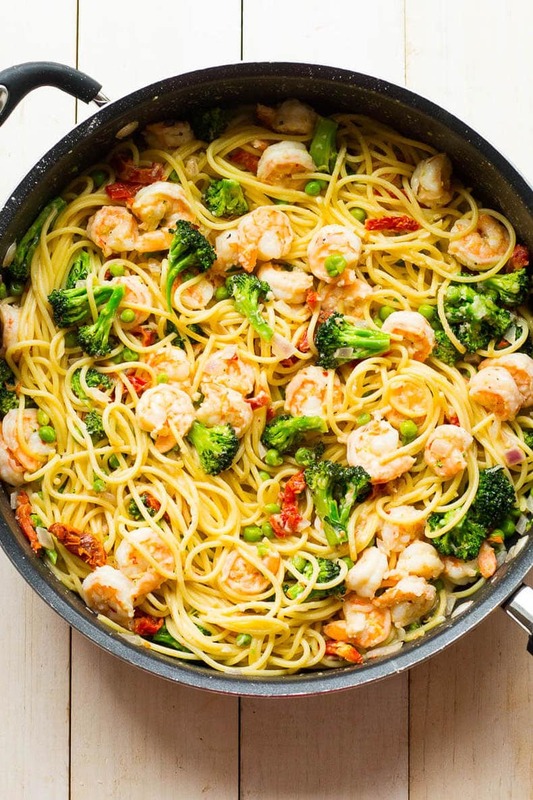 Your pasta dish looks great! I’m with you, Daylight Savings definitely improves my mood too. I wish we had daylight savings here where I live, definitely would love an extra hour of sunlight. Delicious looking pasta too! The only part I don’t like is the fact that it gets so dark come November!! Thanks Thalia! 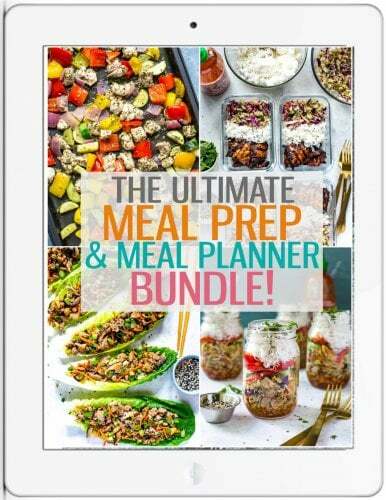 This looks so yummy and perfect for spring! I especially love the sundried tomatoes. Thanks Lucy! Totally agree, I’m obsessed with sundried tomatoes right now! I just made this tonight! Delicious and it was easy to make! This recipe is soooooooooo good! My husband enjoyed this meal with the white wine. This recipe is a keeper. Thank you. So yummy! I had tons of leftover veggies from my daughter’s baptism brunch, but wasn’t sure what to do with them. This recipe was perfect! My family and I really enjoyed it! I will definitely make this again!